On the one hand, Leonys Martin represents the kind of tepid, five category production that owners in 12-team leagues can expect to find at some point on the waiver wire. On the other hand, he was worth nearly as much as Bryce Harper in 2013, clocking in at about $12. 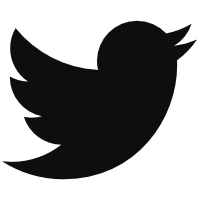 Which leaves us to ponder: what should we do about Martin? Waiver wire hunters know that in mid-sized leagues, players like Martin are available at some point every season (ahem, Rajai Davis). His only standout category was stolen bases, while the rates he posted in other categories were average or slightly below. In Ottoneu, he posted a hair over one point per plate appearance which is close to replacement level for an outfielder. Put plainly, the best format for owning Martin is probably a standard 5×5 roto league. Preferably a deep one. To date, Martin has been best used as a platoon bat. He is currently in line for an everyday job, but the Rangers have been actively shopping for an additional outfielder – preferably one with power. That would move Martin into a strict handedness platoon with Craig Gentry. Most owners have the luxury of waiting for the offseason to play out, but the few owners with a currently active league should assume that Martin will be splitting time. Which brings us to the title question, is Martin a platoon quality bat? His platoon splits sure seem to think so. For his career, Martin possesses a .322 wOBA against right-handed pitching and a paltry .257 wOBA against left-handers. But I’ve misled you. All but eight of Martin’s plate appearances against left-handed pitching came last season. And that sample was a whopping 144 plate appearances (152 PA total with 2012 included). In the small sample that we’ve collected, there are two obvious problem areas for Martin against lefties – ISO and BABIP. His ISO was 80 points lower against left-handed pitchers and he converted balls in play into hits about five percent less frequently. These issues could be related. Strong contact aids both statistics, so it’s possible that Martin is making weak contact. HITf/x data could probably help in this analysis, but alas it is unavailable. However, we can use line drive rate as a proxy for good contact. The above chart is deceptive. 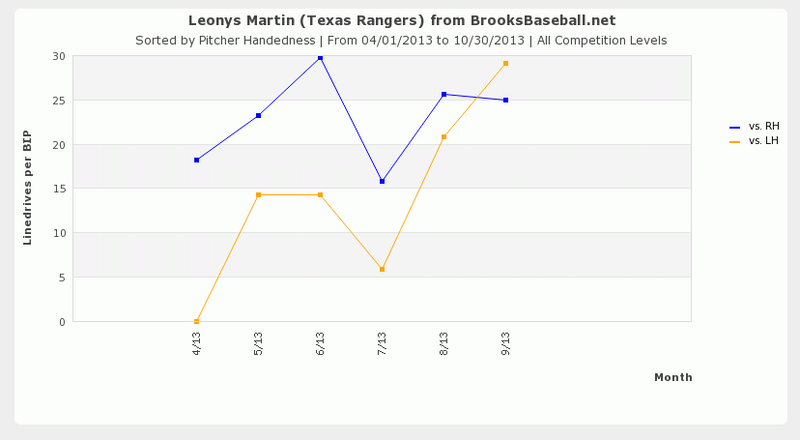 More than half of Martin’s plate appearances against lefties came in August and September. As you can see, his line drive rate was similar against all pitchers over that period, although we can’t rule this out as a fluke*. But it is a positive sign that Martin may have more than a pure platoon skill set. *That’s one of the tricky parts about analyzing this type of data. The chart seems to tell a tidy story about a hitter who “figured out” left-handed pitching late in the season, but it could all be statistical noise. Martin is still relatively young – 2014 will be his age 26 season. It’s been hypothesized that left-handed hitters take longer to learn how to hit same-handed pitchers because they face mostly right-handers growing up. The theory is that if you allow the young hitter to get more reps against same-handed pitchers, he may mature into a well-rounded, everyday player. As an extreme example, Chase Utley featured pretty heavy platoon splits through his age 26 season, but he eventually came to be feared against all pitchers, regardless of handedness. The easier question is: should you, Joe Fantasy Owner, use Martin against left-handed pitchers. That answer is “no.” Draft Martin as a platoon bat and only as a platoon bat. There’s no reason for a fantasy owner to sit through growing pains unless they are in a very deep league. What other information do we need to know about Martin? He will probably bat ninth in the Rangers lineup. That means he’ll see fewer plate appearances per game than we’d like and he won’t have many RBI opportunities. The Rangers did let him spend some time batting leadoff, so that’s the best case scenario. He’s not exactly an OBP machine, so batting ninth seems much more likely. We hoped you liked reading Leonys Martin: To Platoon or Not to Platoon by Brad Johnson! I will challenge. Martin had no platoon issues in the minors and more the scouting reports never indicated a platoon. Like you said, when he stopped platooning in the last 2mo, his LD% was basically the same with a low BABIP. This is Ron Washington to a tee and just like Dusty Baker. Martin is a great OF with a huge arm and solid core with wheels. In no way should anyone with his tools platoon with a guy like Gentry. How does Martin learn to hit LHP in the MLS if he never faces LHP except in sporadic situations? Chris Davis had around 50 ABs v LHP in the MLs, 50! He never had more than 50 consecutive ABs at the ML level until he was traded to the Os. How the hell did Texas even gauge his value with such small sample sizes? The same thing is happening with Martin AND Profar. It’s disgusting. I subscribe to BP, HQ, FG+, etc…so of course if a platoon holds better value than that’s the play, but at some point “sample size” (which you eluded to) HAS to play a roll. Moreland gets his full year to show he’s a AAAA bat, but Martin platoons with Gentry bc Gentry “plays hard” and is a vet? Now, I referred to Dusty bc nothing matters beside “LHH is better v RHP” period. Votto has no platoon split and that’s an enormous sample size, but instead of slotting Votto into the 2-hole behind Choo, Dusty HAD to have his L-R-L-R-L…lineup. Ron Washington has no clue if Martin can hit LHP, he just knows Gentry is a RHH, so he should face all the LHP. Nolan Ryan is used for his name and Ron gets to keep his job bc he knows how to relate to the players? That’s called a coach, as in bench coach, not a “manager” which a baseball team needs. You are right though, Martin will only get his shot at 550 ABs unless Ron is fired or he’s traded like Crush wa to my desperate #Orioles. DYK: Davis had 25 HR in 50 games at AAA the year he was traded for a vet RHP RP specialist. How does that happen? Does Chris Carter get traded for O’Day? The real challenge is reading through your formatting.